Like the previous reviews of light meters, I am restricting this review to affordable temperature meters I have direct experience with in actual project work. Anyone who works with or applied LED technology should consider investing in some form of reliable temperature meter to test results of either products in development, or product performance in the field. The Achille’s Heel of solid-state technology is its susceptibility to failure and degradation from operating at high temperatures. This extends beyond the LED into the driver and power supply components, which are often placed under stress from fixture packaging or location near heat sources. The first issue that a manufacturer will raise when facing a field failure, will be the temperature the fixtures were operated in, either caused by the product design, or the physical application, heat kills LED products. That said, just like photometric test equipment, laboratories and large engineering departments will spend many thousands of dollars on test gear, and calibration services. That’s great if that is the focus of your business. For the rest of us, especially those in small business, the costs of test equipment must be weighed against the myriad of other tools and expenses. So, the question becomes, can one keep the costs low and still get reliable results. The following is an attempt to provide some insight into this, and show solutions I have found to be reliable after several years of using various products with varying degrees of satisfaction. The Basics First. There are a couple of fundamental issues to get out of the way. Temperature measurement requires understanding of the elements of any thermal pathway from heat source (LED, Driver, Power Supply), to the environment. The illustration below shows how there are several layers involved, each presenting an interface that acts like a resister to heat flow, very similar to fluid dynamics. Each resistive layer not only blocks flow and creates a temperature differential from one layer to the next, they also create a resistance to measurement of the components in question. If this is not recognized, measurement results can be quite inaccurate and misleading, which is counter to the purpose of owning and operating any test equipment. A lighting system may have several layers to consider, being aware of this and what that means is important in attaining accurate enough results for use in field and design process applications. This overly simplistic diagram shows how heat generated from a source passes through resistive layers that must be factored into temperature readings to appraise how hot the source is actually operating at. 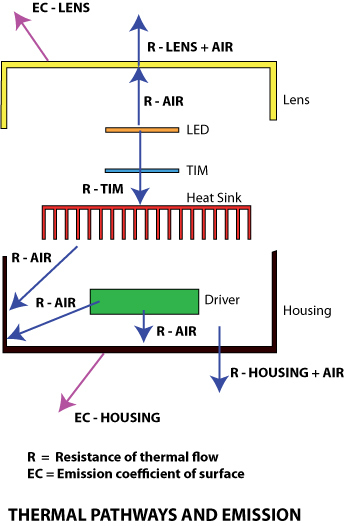 In addition to the layers of resistance between a source and the ambient environment, when considering thermal measurement, is both the resistance of the surface being tested, as well as its emission coefficient. This is a factor of how effective a surface is in radiating energy from the material itself. Materials with low emissivity (low emission coefficient) will run hotter, simply because the surface is not releasing thermal energy contained within the material itself. Knowing what this value is is critical when taking temperature measurement, especially when using infrared non-contact type meters, which are very susceptible to error from differences in surface emission characteristics. Types of Meters. For most applications there are two types of sensor technologies. The first is contact based, which means making direct contact with the material being tested, by gluing, clamping, or pressing a probe onto the surface to collect a measurement value. The second is infra-red non-contact sensing, which is simply pointed at the surface, usually with some form of guide laser of visual image to show where the meter is pointed. Both are easily obtained for just a few hundred dollars, to several tens of thousands, so the choices are infinite. Infrared Meters. Infrared meters are in many ways just light meters tuned to a narrow infrared spectrum. By measuring the amount of IR energy present on a surface, these meters deliver a value, calculated by the meter’s computer based on field of view and distance from the object. While tempting due to their ease of use (point and shoot), they produce highly unreliable results unless the operator understands that the surface of different materials produce decidedly different temperature readings, even if the surface itself is the same. For example, black anodized 6061T6 aluminum has an emission coefficient of close to .97, while raw aluminum of the same allow, without the anodizing, has a coefficient of less than .50. That means the raw aluminum object will appear hotter than it actually is to a meter with no means of changing calibration to reflect this difference. Since the range of materials and state of surface roughness, color, reflective properties varies widely, IR meters are generally not reliable enough for field or lab work. The exception to this is when other temperature measurement methods are in use to establish a baseline or calibration point, where the IR non-contact readings can be used for intermediate quick-checks in-process of test projects. The Control Company 4477 is a simple laser guided IR meter. It works fine for simple tests, but does not have a means to accompodate variations in emission characteristics of the surfaces being measured, so creates odd results at times. This small handy $65 IR test device works fine, and has proven to deliver accurate results against much more expensive equipment, when the emission coefficient is assumed to be 100. There is no way to set the device up or change what it uses as an emission coefficient, so this produced odd results at times, causing me to look deeper into why. The first instance was testing an aluminum fixture with a cast head and extruded body. The contact meter and touch-test indicated the head was much hotter than the extruded body, but the IR meter said exactly the opposite, an error of significant proportions to cause me to rethink use of IR meters of this type beyond spot checking where emissivity could be eliminated as a factor. The Fluke VT04 is a visual thermometer with added features that make it a solid IR temperature meter in a wide range of applications, at a very low price. 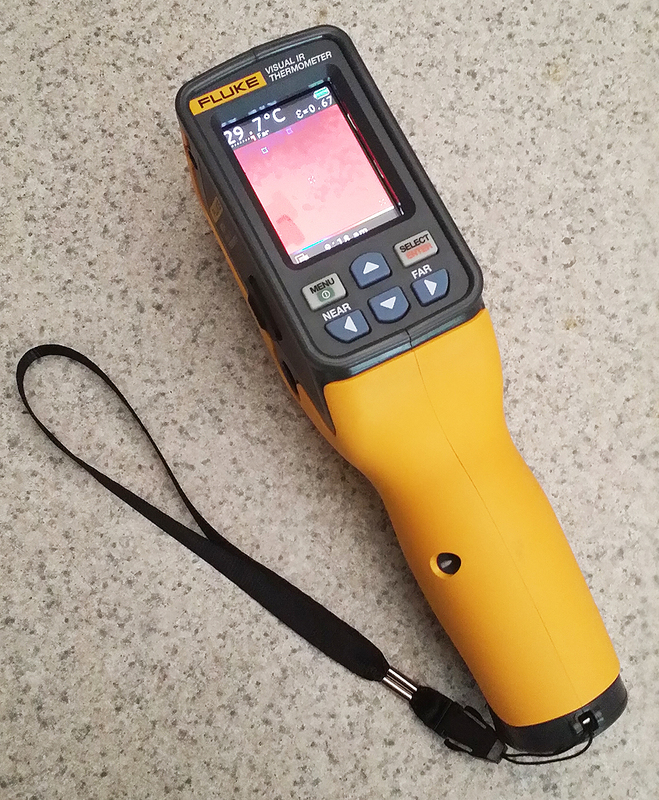 The Fluke VT04 is not a thermal camera, although it produces images appearing very similar. 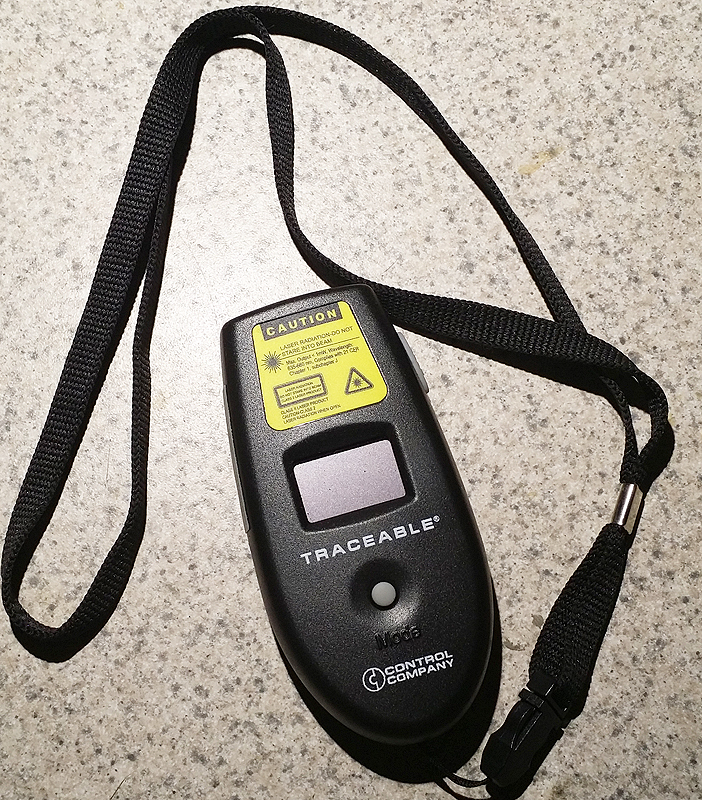 At around $750, this is not going to be in every briefcase, but it does offer a significant improvement and far more valuable information than a simple handheald IR meter. The critical advantage of the VT04 is in its including a method for entering emission coefficient values. This removes the variable that causes erroneous readings with other IR meters without such feature. The VT04 is a visual camera based device, which allows you to see the product being tested, with various degrees of thermal coloring overlaid, from none to full IR. I’ve found this very handy when testing a product as it warms up, providing an image of the heat expanding through the product, and comparing that to similar readings in different ambient environments or uses. I also use this meter to locate hot spots on fixtures, which I then attach contact probes to, should there be an indication of a problem worthy of additional investigation. 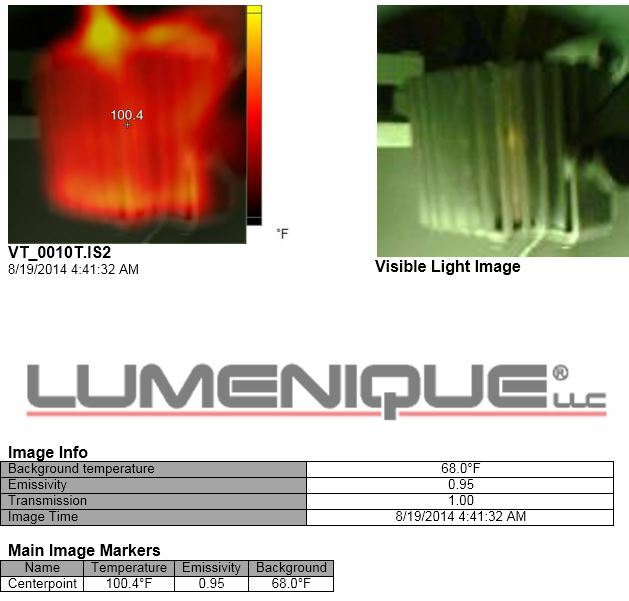 This simple report created using the Smartview software that comes with the meter shows the low res photo and thermal image overlay the meter produces. Note that their is only one temperature reading – in the center. However for the purposes it is used for, this is sufficient. The meter can also be connected to a PC to create reports, fine tune the image and its thermal image layers. As far as infrared meters is concerned, this is a decent device for the money. However, what it teaches is that this type of measurement (non-contact) requires spending several thousands of dollars to be truly accurate. True infrared cameras include interpretation software, higher end sensors, and greater resolution to deliver better results. However, when testing them against the VT04, and surface probe data, I found that when measuring objects with multiple materials and emission coefficients, the meters all produce inaccurate results from one material to another if the materials have a greater than a few points difference between them. For this reason, regardless of how much is spent, IR meters are either too expensive and/or too imprecise for use in light fixture testing. In my own application, the VT04 is used for visual reporting, or to spot check known product performance, compared to prior results, or in different ambient environments, where the baseline has been set using contact sensors. In evaluating wheter spending several thousand dollars on a FLIR product (the leader in IR cameras), I concluded that the money was better spent elsewhere. Contact Meters. While there remains an issue of thermal resistance between the surface being tested and the thermocouple probe, and to a lesser degree emission coefficient effects as well, connecting a thermal probe directly to the surface of a product. One cannot forget that to some degree, testing anything by touching it in any way does impart a certain amount of impact on the results. For example, attaching a probe that dissipates energy becomes part of the thermal path, which reduces the measured temperature. However, this is somewhat rare for the majority of testing of lighting products, either in a lab or in the field. To connect to the fixture, there are many different types of probes available. I use ring probes that can be screwed down, bead probes which are usually glued to a surface with thermally conductive adhesive (don’t forget the resistance factor when taking measurements here), and blade probes that can be trapped under a heat source (can also cause issues with thermal path efficiency, so be careful). Many multi-meters include a thermometer capability in them, requiring that one simply purchases the appropriate probe and adapter to start measuring. However, taking one temperature at a time is a long process. I’ve found that no less than two channels is needed, and use four regularly in project work. The drawback of course is having to place the probes, either on surfaces, or inside the fixture, to gather the necessary data. However, when the goal is to understand what’s really happening within any system, this is the best and most reliable approach. The Amprobe TMD-10 is a simple 2 channel meter that uses either K series or J series probes. A great basic level meter for those needing accurate readings of one or two points. This is a very affordable little meter at under $125. It provides readings in two channels, allows use of any popular style of probe, is compact, and easy on batteries. In comparing this to other meters, I have found it to be just as accurate as high end devices, so have no problems using it to extend the number of test points when my other multi-channel meter is used. The readings can be in either C or F, the high and low settings can be retrieved, and the intuitive simplicity of the package just makes it an easy go-to device when all that is needed is a quick result with little fuss. Not much more to be said here. The simply works well, and is easy to set up. Keep in mind that when connecting any probe to a surface, thermal resistance can create errors in the results. Thermal paste, and adhesives are best applied thick enough to eliminate gaps and air between the probe and surface, but thin to avoid losses through the interface material. I use arctic silver pasts and adhesives for this, as they produce the best thermal transfer. The additional time a thermal epoxy takes to set up results in better results than instant adhesives. However, CA instant adhesives are commonly used, but can produce poor results. Another method of attachment is aluminum tape, which produces an instant and easily removable connection. The trick is maintaining solid contact with as little material between the probe and the surface as possible. The Reed SD-947 has 4 channels + autmatic datalogging, making ti a great lab companion, while still being small enough to be used in the field. When the task at hand requires collecting data from multiple points, over a length of time, having a meter than can collect data automatically is a must. This meter is not only accurate, but is less than $250, records 4 channels of data on an SD card. It can use vertually and type of probe, including J, K, R. E. T and S, so finding the right setup is just a matter of shopping around. 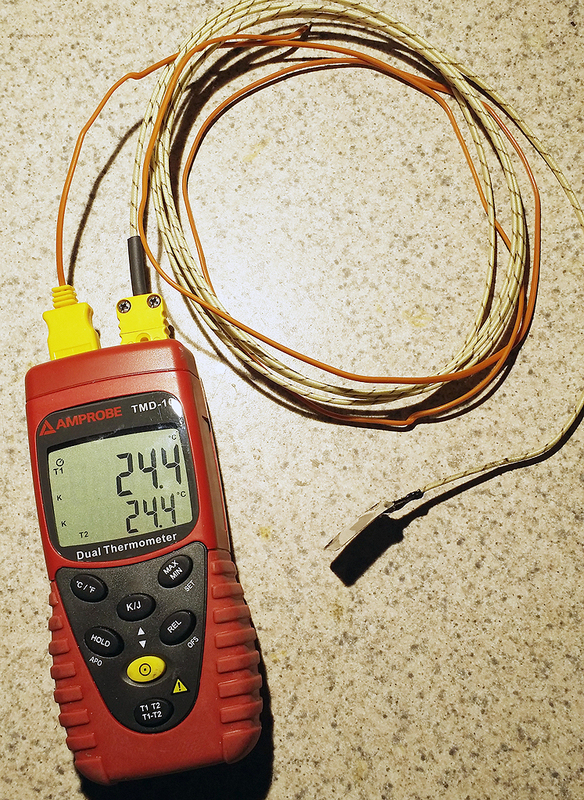 I generally use K probes, as they can be purcahsed anywhere, and work with the two meters I use, as well as the adapter I have for my Fluke multi-meter. The meter can be setup to take readings at any interval desired, recording the information directly in MS .xls format for evaluation and report generation. I have found that programming the meter can be a bit fussy and painful. The menu system is a bit clumsy operated from the keypad. However, if the instructions are in hand, there is no issue with getting the job done, and once set up, it remembers after power down, so the most common setup remains in place. There is also a feature to see T1-T2 temperature that allows direct comparison of two probes to one another with a single button press. While this seems meaningless, it’s very hand when checking thermal resistance from one side of a material to another, such as through a thermal interface material (TIM). For the money, I have not found a better device for in-house thermal testing. I’ve used in in field testing of products, in-house lab testing, and during photometric tests. Usually, the probes are set up to measure the LED at some contact point, the driver at an identified thermal contact point, the fixture body and/or lens, depending on how complex the product is. In cases where I need to include two more points, I employ the Amprobe meter as an auxiliary, which works fine if these points do not require data logging. As LEDs become more common in the market, there will be greater instances of issues emerging from temperature effects on product performance. This includes simple application of retrofit lamps, where high temperatures cause driver and power side failure rapidly, to indoor linear products trapped in restricted airflow of coves and architectural details. Testing products is critical to identifying issues before they become failures. 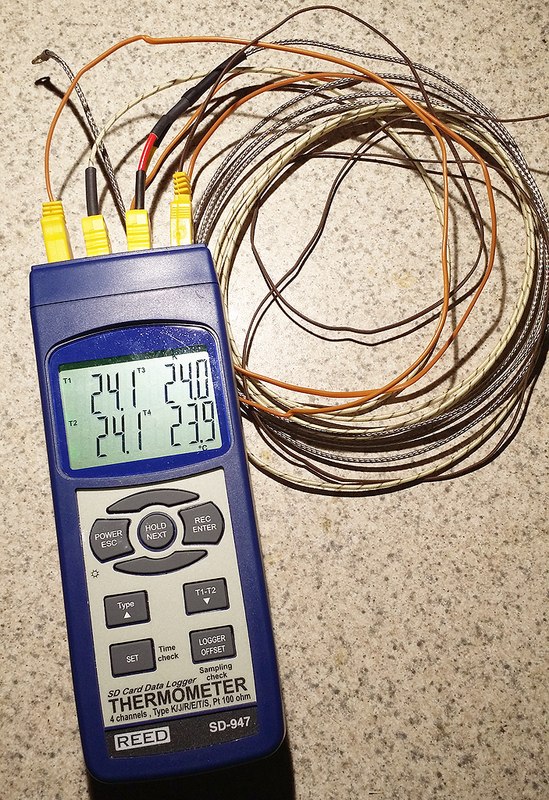 In my own product, Tasca, we’ve used temperature tests to refine the product and increase its performance. By adjusting components, light output has increased over 25%. Further, through testing of the product in elevated ambient environmental conditions with restricted ariflow, I now know I am producing a reliable product for virtually any space it might be used, from the cold of winter to the extreme heat of a shop in Arizona. Temperature testing does not require massive expenses, as the products reviewed here show, but it does require a little effort in researching and understanding how the materials, surfaces, and thermal interfaces between components, and between surfaces and the meters sensors (contact of non-contact) in order to avoid errors in the measured results. This comes from digging into the topic in some detail, which everyone in the modern age of lighting should do anyway, and experimentation to see for yourself how these devices work.